Common Knotgrass is an erect, ascending or prostrate hairless annual weed, branched mostly from base. Leaves are of two types - lower larger on main branches, smaller on the lateral and upper branches, 0.8-2.5 x 0.25-1.0 cm, elliptic, lanceshaped or ovate, pointed, entire, dotted. Ochrea 0.75-1.25 cm long, bifid, silvery, membranous lacerate. Inflorescence occur solitary or in 3-5 clusters in leaf axils. Flowers are 0.5-0.75 mm across, on stalks 0.5-0.75 mm. Ochrealae minute. Tepals are 5, 1.5-2.0 x 0.5-1 mm, elliptic-lanceshaped or ovate, blunt-pointed, entire. Stamens are 5, filaments short, equal; anthers dorsifixed. Ovary is 0.25-0.5 mm, ovate - circular, trigonous with 3 very short styles and capitate stigmas. Nuts are 2-2.5 x 1.0-1.5 mm, ovate, trigonous, black, shining, striate. 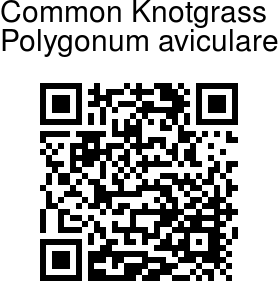 Common Knotgrass is a weed found worldwide, with origin uncertain. 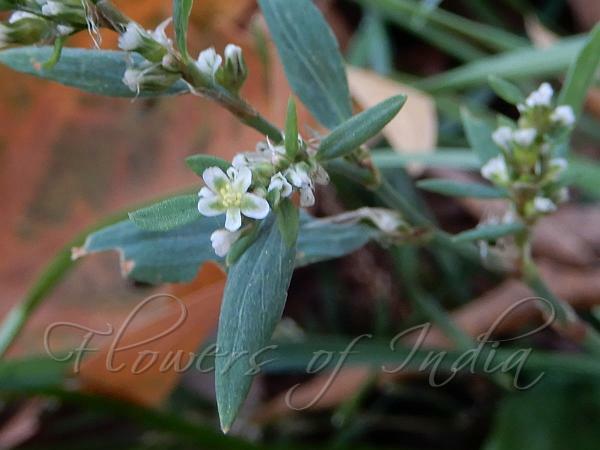 In India it is found in the Himalayas, at altitudes of 2200-3800 m. Flowering: March-September. Photographed on Manali- Leh Route, Lahaul- Spiti, Himachal Pradesh.